Today on the Yarnthing Podcast with Marly Bird: Kristi Simpson, the designer behind RAKJpatterns! Kristi taught herself to crochet 6 years ago after her daughter received a crochet scarf kit for Christmas. Her daughter kept bugging her to help her learn and when she finally did, she couldn’t but it down! She went from just crocheting for herself and family to opening a store on Etsy selling the items she made. This lead to selling her designs. Kristi has been published in several crochet magazines and has published one book, with another one coming out in May this year and she is working on another one (can’t tell you anything about that one yet!). Her first book, Sweet and Simple Baby Crochet, was just published in October of last year. The book as 35 items for newborns to 1 year old babies and they range from garments like hats and sweaters to accessories like blankets and toys. (I have to say, the hat on the cover is super cute!) 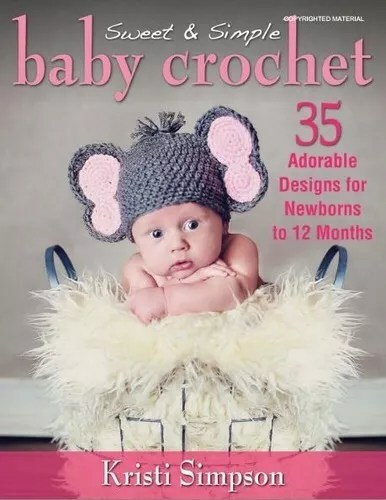 Her newest book is called Mommy and Me Crochet Hats and has 30 hat patterns size for both kids and adults. Kristi doesn’t do this by herself, her husband was able to join her as her full-time business partner several years ago. They maintain their website, RAKJpatterns.com, their Etsy store, RAKJpatterns by Kristi Simpson, and their social media. You can find Kristi and RAKJpatterns on: Facebook, Ravelry, the website, and Craftsy. And we won’t forget the GIVAWAY! Leave a comment below with the keyword for your chance to win any three of Kristi’s patterns! I’ve been following RAKJpatterns for a few weeks now. Love them all. So I’m new to you. Have to say, was a big fan of today’s podcast. It was neat getting to learn more about her and her patterns. I’ve just started selling items so it was really nice to listen to how she got started. And I don’t know about you girls, but my yarn stash is starting to over take room. To help with that I’m starting a 365 granny a day project to use up those last bits that I can never seem to use up. I think it’ll end up making a very cool and interesting blanket or two or three. Can’t wait to listen next week! Yarn is my favorite medium for creating magic. Fun podcast! Yarn, yarn, yarn, I must admit I am addicted to it. I especially love to make baby items. I get so excited when I get invited to a baby shower. I enjoyed learning more about Kristi. Thanks for another great show! I love any projects that use yarn and making baby stuff makes us all happy! I hope Kristi can come back in May when her next book is out. I love to make both knit and crocheted items and making baby items is always a lot of fun! There is always something great about creating something beautiful out of yarn and needles or hooks. Hello my name is Kim.. I have been buying since Jan 2013. I have over 300 yarns in my stash. yes I admit I am a yarn addict! Adding my love of yarn and the Yarn thing podcast! Yarn is the best thing ever. It is such a part of my life. I’ve been crocheting for over 10 years and knitting for 1. Gosh, I hope I win this book.. I have soo much yarn it would be wonderful to crochet something for each of my 5 grandbabies!! This book looks like it has some awesome patterns in it! I have a huge yarn stash and never enough patterns (or time) to make the items I would like to make. I don’t think I will EVER run out of yarn! I love Kristi’s baby crochet patterns! She clearly has an artistic eye and crochets beautiful pieces from yarn! She was a great guest and I hope she returns to the show. I’m always so happy to hear other people have a yarn addiction too! I am Sandy and I am a YARN addict! I would love to get this book. I have so much yarn and 2 little babies (nephew and my friend’s first baby) to crochet for! As always great Podcast Marly! Thanks for the introduction to RAKJ patterns. I so enjoyed the show yesterday. I have several bins of yarn that could be used for learning to crochet instead of using all of them for knitting projects. Your book sounds like so much fun. Yarn is the best thing. I just keep finding new colors and designs. There are so many that I’ll never get to use each and every one of them. I crochet and knit. My niece is having a baby in March and I can’t wait to make some items for the baby soon to come.